The morning of June 17 was sunny, and the Osmia aglaia finally came out of their emergence containers and started foraging, mating, and searching for nests. In previous posts I've discussed their foraging on black raspberries and other flowers in the sturm fields. As temperatures warmed, there was lots of activity in the shelter. It's impossible to capture a sense of that activity in a still shot, but perhaps you can get an idea from this photo showing bees checking out empty tunnels in the webcam shelter. 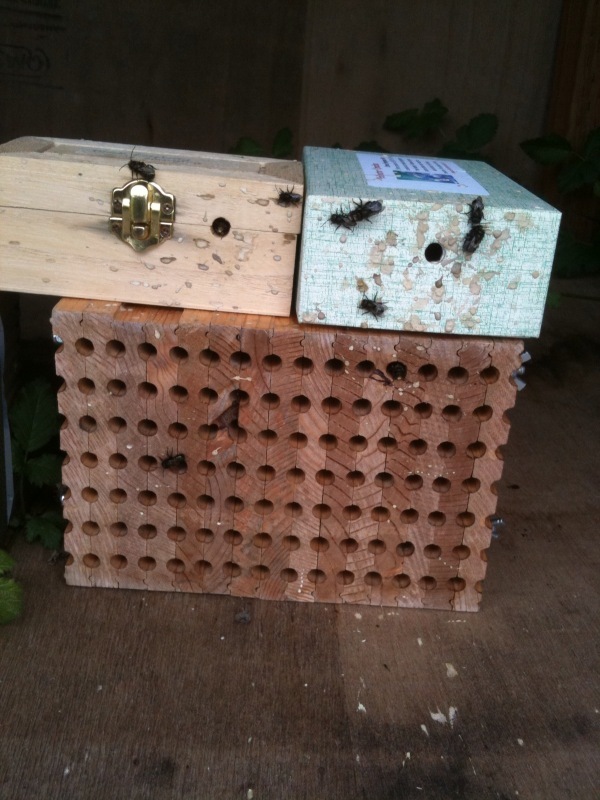 Three were crawling around on the bottom board, and click on the image to see bees in tunnels on the upper board. The bees spent quite a bit of time sunning on the ground around the shelter; I even saw some sunning amongst the blueberry plants. Here's an O. aglaia couple mating on a black raspberry leaf. Usually mating takes place early in the life of the bees, so this is further evidence that the O. aglaia had probably not yet started nesting. 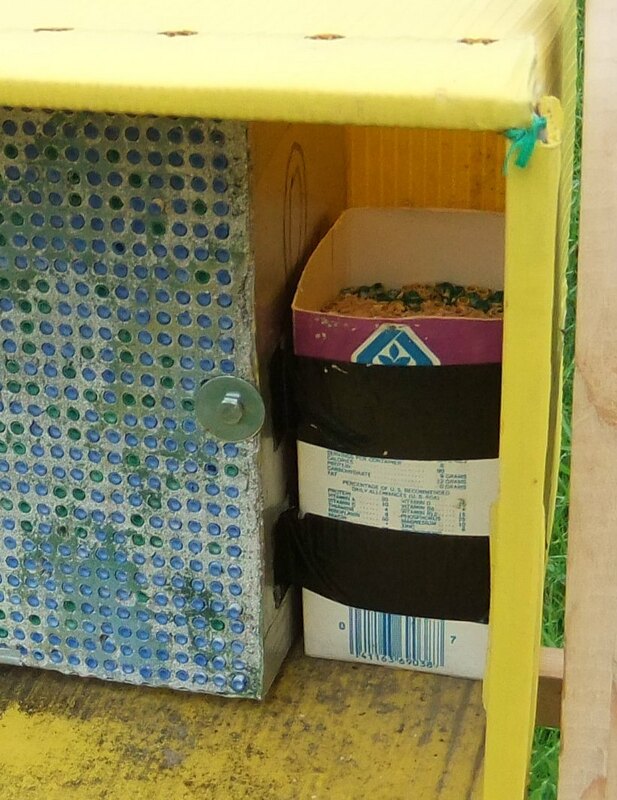 We added some additional Binderboard nests to the shelters before we left. Here's the webcam shelter on June 17 after adding the additional nests. 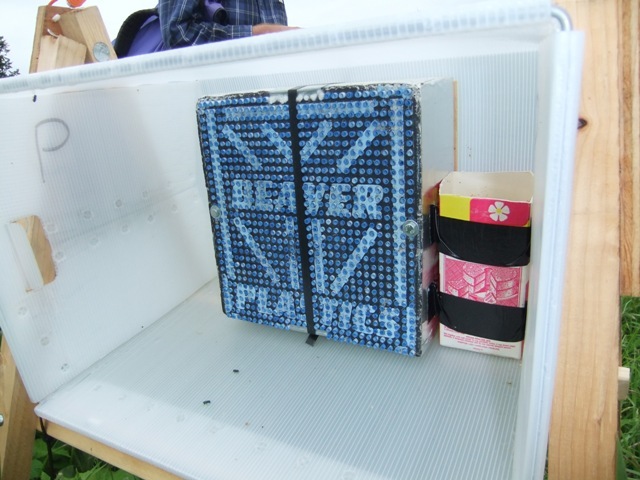 Before we left we put the lids back on the emergence containers and moved them to the sides of the shelter. We also added more Binderboard nests to the Marion Berry shelter before we left. One last thing that I should mention. After taking one last ride around the farm to see if there was any O. aglaia activity yet at Jim Cane's shelters (none seen) we saw Don's beekeeper setting up more honey bee hives just east of our marion berry shelter. There were 10 hives with a total of 24 supers. This makes a total of 29 honey bee hives in Don's fields. That's a large number. It will be interesting to find out if they have impact on our O. aglaia reproduction this season. Eric Mader from the Xerces Society in Portland, OR, contacted me in May. He explained that "Xerces has some funding (through a national NRCS grant) to work with various specialty crop producers in different regions of the country to develop bee habitat on their farms. For the most part this consists of restoring native flowering plants that compliment crop bloom times by providing additional pollen and nectar resources. 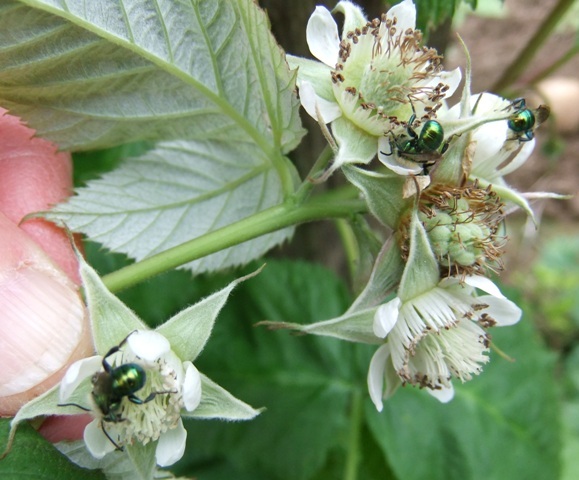 "We have some additional funds to field test this same strategy with a berry grower here in western Oregon and Washington, and I wanted to check with you to see if this might be a useful opportunity to compliment your existing Osmia aglaia project?" Naturally, I suggested that the Sturm Farm might be interested in participating, but it wasn't until my visit to the Sturm Farm in June that I was able to arrange for Don and Eric to meet. Fortunately Eric was available on short notice to come out to Corbett the afternoon of June 16. It turns out that Don already has an NRCS grant for wildlife plantings, so the Xerces grant will supplement it and provide some guidance on the most suitable bee-friendly plants. Don had a meeting at 1pm that afternoon with the local NRCS representative, and then he hurried back to the farm to meet Eric at 3pm. Eric showed up with another Xerces staff member, plant ecologist Brianna Borders. By then the clouds had cleared and the sun was out. Don loaded us into his truck for a quick tour of his 140 acres of berries, including all of the O. aglaia shelters. Here we are at Jim Cane's central bee shelter near the marion berries. Don is on the right in white shirt; Eric is in the center with Brianna behind him, and my husband John is on the left. Notice that we moved the bee nests from the pallets on the right to the new wood shelter. If the bees had been active this would not have been a good idea, because they would not have found the new nest location. 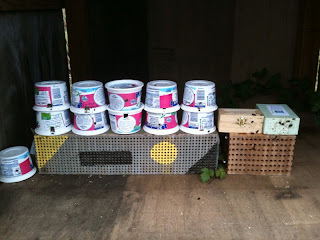 But since the bees were not yet active, it was a good time for the move. 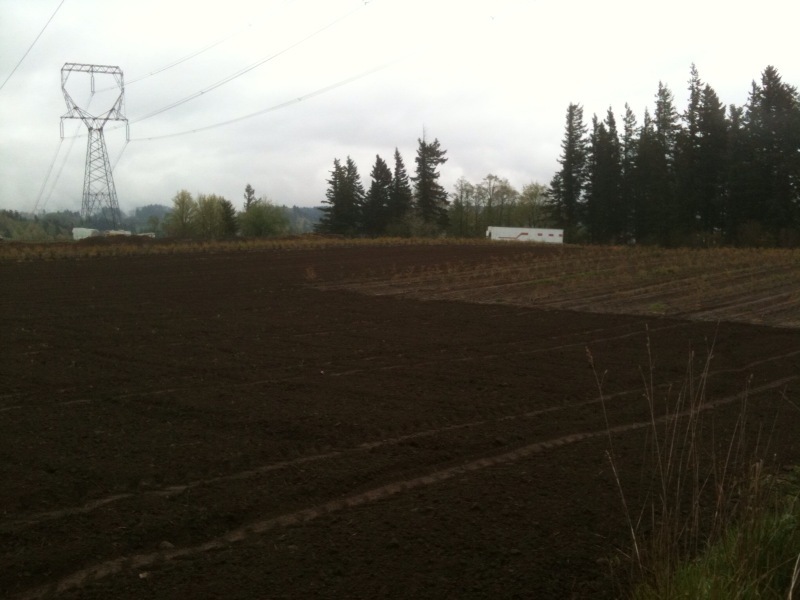 Don and Eric decided that this location would be the best place on the farm for bee-friendly plantings. It's central location will make it accessible to bees from other parts of the farm, and this open area will be easy to cultivate. in preparation for planting. In addition to checking out the nest sites for O. aglaia, we spent a little time seeing who was visiting the black raspberry. 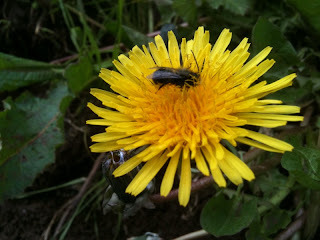 There seemed to be far fewer bumble bees in the afternoon than in the morning, when it was overcast and cold. I had collected a few of the bumble bees that I saw in the morning, and Eric identified the more common species as either Bombus melanopygus or mixta, and the less common species as B. vosnesenskii (see photo of this species in Part 2 of the posts on black raspberry bloom). We also noticed a neat hole at the end of a prunned raspberry cane. Eric used his pen knife to slit the cane open, and there we found a couple of Ceratina sp., the small carpenter bee. This genus makes it's nest by burrowing into pithy stems such as Rubus canes and dead common mullein stems. One has to cut the stems so the pith is accessible to the bees. After creating a nest with a series of offspring cells in the stem, the mother Ceratina bee guards the entrance of the nest and periodically checks on her developing offspring, according to a thesis from University of Georgia in the 1970s. There were two bees in this tunnel, and not much of a nest, so I suspect that these bees were just beginning to nest. Don says that he leaves the prunned canes in the black raspberry but not other berry varieties. I recommended that he cut the brown stems of last year's common mullein stalks that are found around the edge of the farm so there are more nesting sites for Ceratina. There are some in the Himalayan blackberry patch where Jim Cane's mail tote shelters are located. Ceratina is probably a good raspberry pollinator, and it would be great to increase their populations. Hopefully Eric and Don are moving forward on this project. 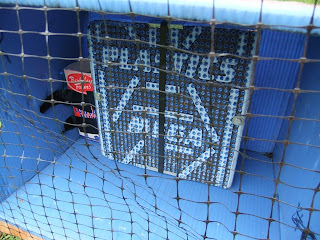 Maybe we can get some photos of the site as it is planted on this blog. Eric is also hoping that we can have a farm field day next spring to showcase the bee plantings and alternative bees. As discussed in the two previous posts, our shelters had quite a bit of activity of both Osmia lignaria and Osmia aglaia, especially on the sunny morning of June 17. Meanwhile, Dr. Jim Cane from the USDA ARS Bee Labs in Logan, UT, had introduced quite a few of his O. aglaia in different parts of the berry fields. What was happening in them? One of Jim's shelters is located in the center of the berry fields, close to our central shelter near the marion berries. When we first checked it out, the bee nests were in cardboard boxes sitting on a stack of pallets with a board as a roof on top. Next to the nests was a new shelter that Don's father built. Don hadn't yet had time to move the nests. We did not see any bee activity at this shelter. 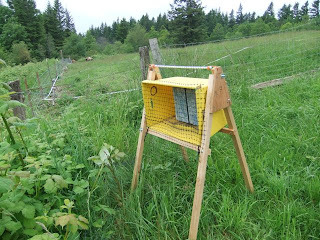 Last year all of Jim's bees were released in the southwest corner of Don's field, next to a large patch of Himalayan blackberry (see last year's posts). They were released in several of Jim's mail tote shelters. This year three mail tote shelters are back, flanked on either side by one of Don's dad's wood shelters. The first photo shows the shelters from the west end looking east, the second photo shows the shelters at the east end looking west. 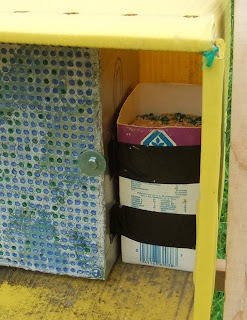 The straws with bees are all in the wood shelters. We saw no O. aglaia activity in these shelters, but we did see a couple of O. lignaria working on nests in the wood shelter in the farthest southeast corner (first photo). 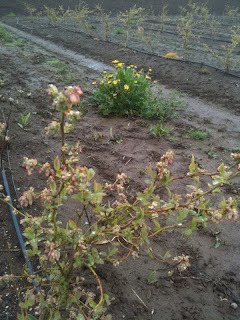 As of June 17, the Himalayan blackberry had lots of buds but no bloom. The last set of shelters is also at the west end of the farm, but further north, across a wide valley full of Himalayan blackberry. There are some commercial berries in this field, as well as Don's Christmas trees. At this site there are two of Don's dad's wooden shelters, as well as a shelter consisting of cardboard boxes on pallets with a roof on top. Here's the view from the center shelter, looking over the valley that is totally covered in Himalayan blackberry. No one walks into that thicket. Across the valley you can see the power lines where Don's main fields are located. The white line next to a spruce tree to the right of center is the honey bee hives shown in the previous post. These photos were taken on the morning of June 16 when it was still overcast and cold. This and the next photo were taken on the morning of June 17 when the sun was out, and there was lots of O. aglaia activity in our shelters. However, there was very little activity in Jim's shelters. If there had been, sunning bees would have been visible on the floor of the shelter. No activity seen in a close up of the emergence box of filled nests on the left, or in the bee boards on the right. We did see O. lignaria in this third set of shelters. 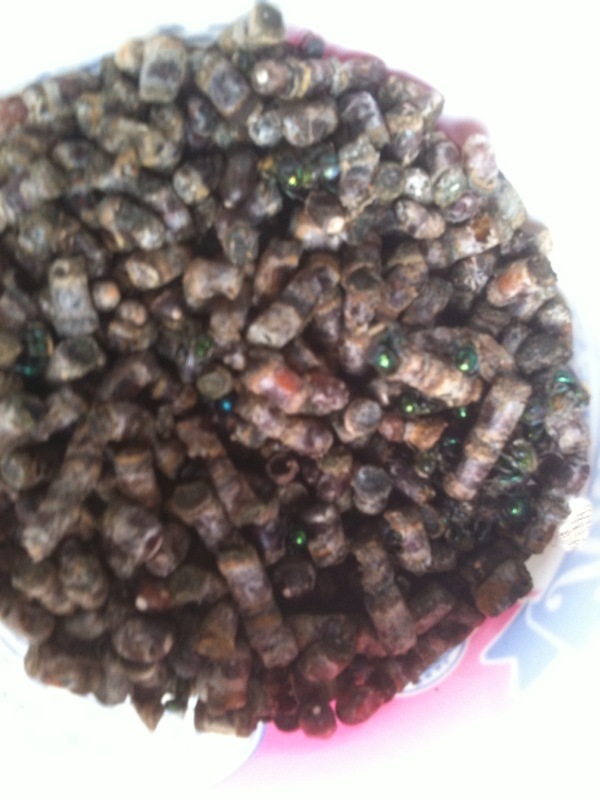 Some of the bees were hiding under the wood shingles of the roof. One is seen in the center of the first photo. Can you see the two in the second photo? They look superficially like flies, but they are O. lignaria. One is on the board on the right, the other seen from the side, between the boards.